Born and raised on the Bellarine Peninsula of Victoria, Stephanie’s interest in the arts came about at an early age. 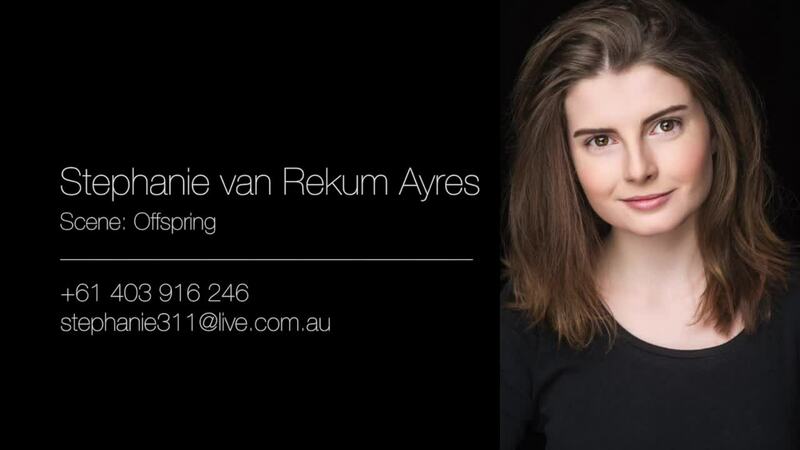 In 2013, Stephanie was accepted into a three year BA (Acting) at Federation University Australia and relocated to Ballarat to study at the Arts Academy. Her Arts Academy credits include Young Woman in Machinal by Sophie Treadwell directed by Kim Durban, ensemble and band member in Oh! What a Lovely War! by Joan Littlewood and the Theatre Workshop directed by Bryce Ives and Nate Gilkes, Olivia Meahan and Mrs Grimsmore-King in the premiere of Ebbingtide written and directed by Ross Hall and Robin Starveling in A Midsummer Night’s Dream by William Shakespeare directed by David Wicks. Stephanie also appeared as an ensemble member in Echidnas, Enchiladas, Epiphanies and People Called Duncan written and directed by Arli Faruk and Oliver Cowen and as The Drunk in The Park by Fennian Dawson directed by Mark Simmonds as a part of the Student Play Festival. More recently Stephanie played Jenny in the film adaption of Laurent Boulanger's The Novelist and appeared in A Midsummer Night’s Dream presented by GJ Productions, this time playing Snug and Peaseblossom. Stephanie is excited to appear as Jane in the upcoming web series, Iron City.